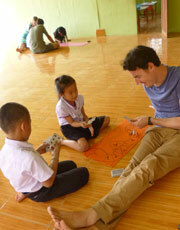 Big Sister Mouse is our new school in the countryside, on the outskirts of Luang Prabang. Children love having visitors and in this picture, they get practice with both math and English as they play the Happy Snake game. Each player gets three cards. If they can add or subtract them to get the designated goal for that road, they move their marker ahead toward the snake's head. We wouldn't have gotten this far without help! Literacy doesn't mean much if there's nothing to read. These people and organizations have brought new books to Laos during the past two years, by sponsoring the publication of a title. Thank you! * Rory O'Callaghan (Ireland): Fire in the Straw! * Yatai Food Cart, Denver (USA), and the Cubit Family (Australia): What's in the Market? * Peggy Horn, (Australia) and Manoj and Bory Paul and A Sing, (USA, Cambodia, India): English is Fun! Will you join them to help promote literacy in Laos? Here's the list of titles that still need a sponsor. These people have donated enough to sponsor a book party and donate more books to a rural village school. Thank you! Most village children still have no access to books. Come see what happens at a book party. Will you sponsor or co-sponsor one?